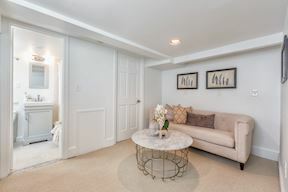 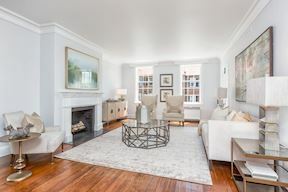 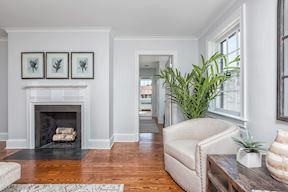 Presenting this beautifully refurbished semi-detached 1801 Federal townhome in the fashionable East Village of Georgetown. 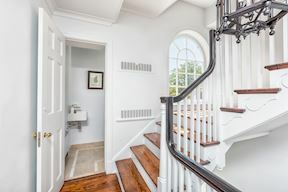 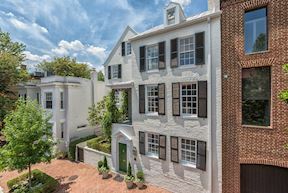 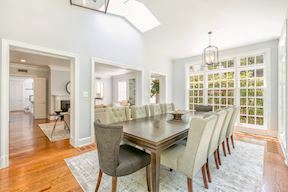 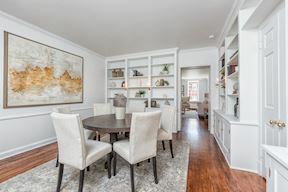 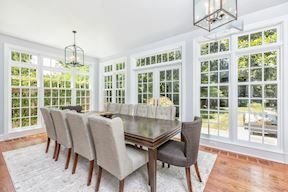 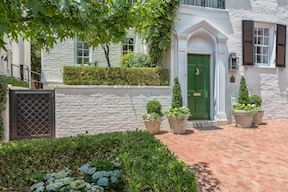 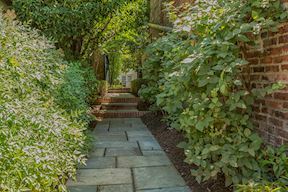 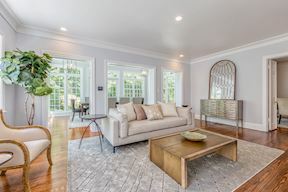 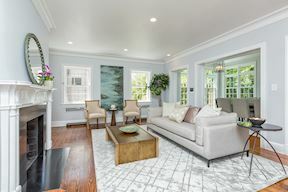 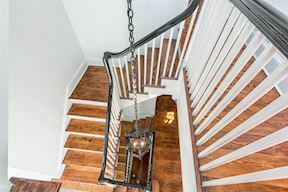 Combining the beauty of the past like newly restored wide-plank heart pine flooring with the latest technology such as smart phone thermostats, this house epitomizes the greatest of Georgetown living. 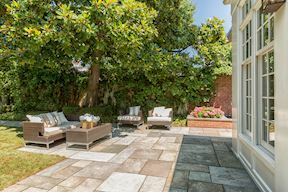 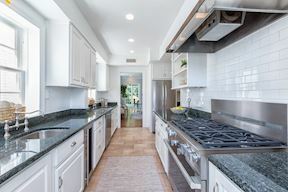 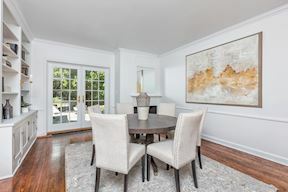 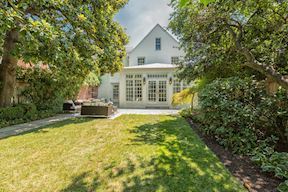 The spaciousness in both the living and private areas, complemented by the expansive green space, is not often seen in properties in this historic neighborhood. 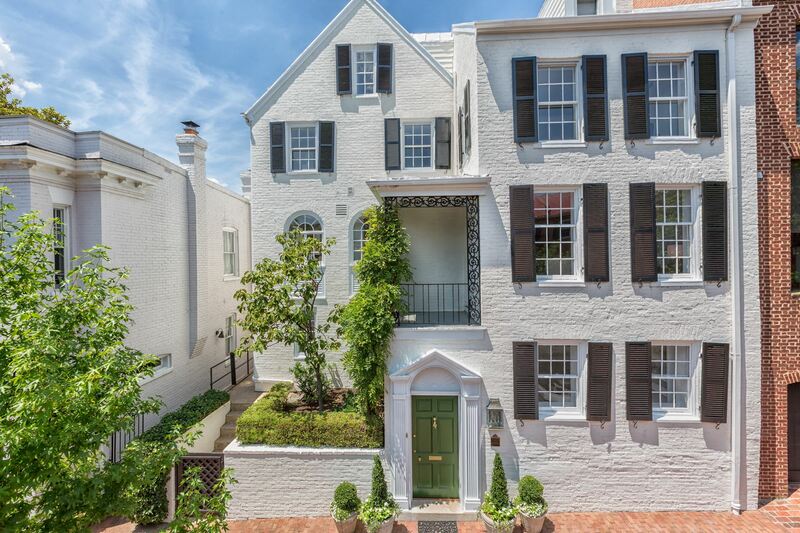 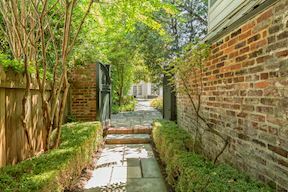 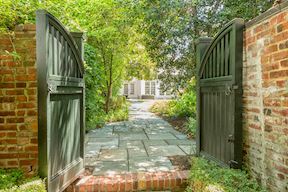 The professionally landscaped back garden and yard is among the most private in Georgetown. 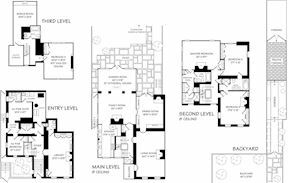 To enhance the possibilities of the property, it comes with an easement grandfathering a pool if desired. 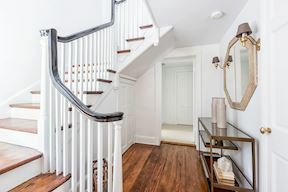 The light that floods this home makes every room cheerful and welcoming. 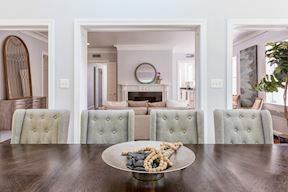 The flow and openness of the main level is perfect for family as well as entertaining. 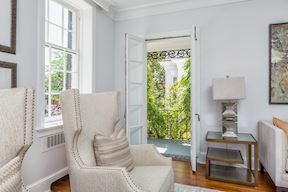 The living room looks out onto one of the quietest streets in Georgetown, and a small balcony offers a breezy retreat. 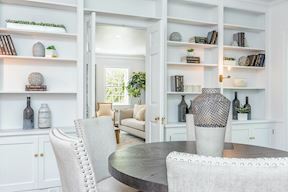 The dining room with built-in cabinets and shelves takes advantage of the garden views, especially the wall-high fountain which adds extra interest and beauty to the garden. 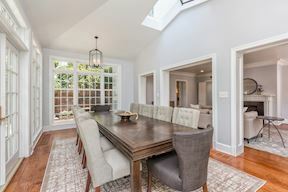 The family room is the hub of all activities, bringing the sunroom, dining room, and kitchen together. 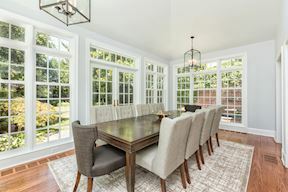 Being in the sunroom is like being outdoors with its floor-to-ceiling windows bordered by a large slate terrace. 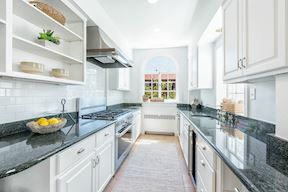 The kitchen has a French country feel and is a gourmet cook's delight with its new six-burner Miele stove and wine cooler. 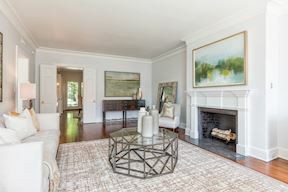 The living, dining, and family room have wood-burning fireplaces. 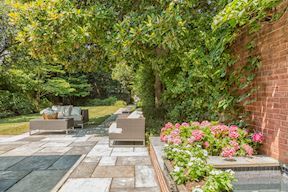 The patio that adjoins the sunroom and fountain introduces a truly expansive, newly sodded lawn that is bordered by beautiful landscaping which includes different varieties of azaleas, hydrangeas, trees and seasonal perennials. 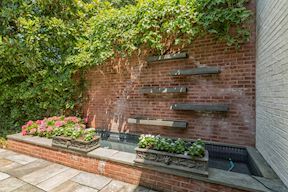 An automatic sprinkling system keeps the grounds verdant. 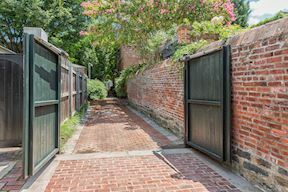 Because the property extends the full block, the owner and visitors can take advantage of the three-car parking and enjoy the delight of a brick and slate walkway bounded by beautiful shrubbery which continues past the yard to the house patio. 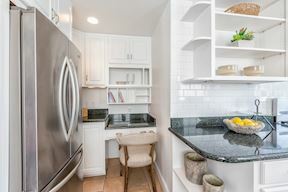 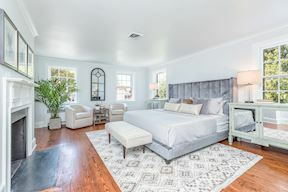 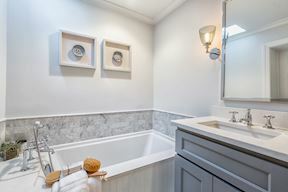 The private space of this luxurious yet inviting home begins with two spacious bedrooms joined by a renovated bathroom with Carrara marble throughout, Waterworks fixtures, large separate shower with thermostatic control, soaking tub, and double vanity. 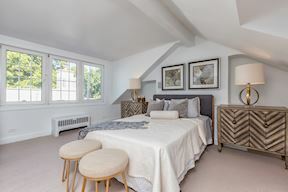 As spacious as these two bedrooms are, the master bedroom with a fireplace is even larger. 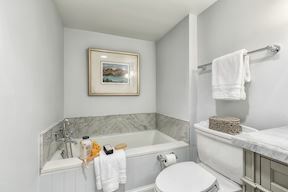 The master bedroom suite has two separate bathrooms. 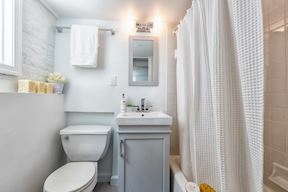 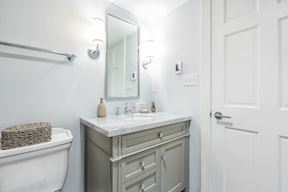 One bathroom has a striking vanity, soaking tub and toilet while the other has an identical vanity, shower with thermostatic control and toilet. 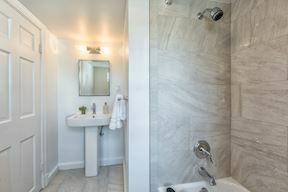 Both are dressed in Carrara marble, Waterworks fixtures and lighting, and heated floors with thermostats. 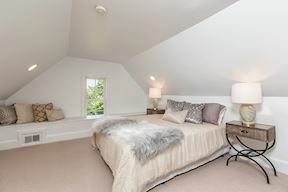 The uppermost level of the house features another spacious bedroom with an expanse of windows and access to the roof. 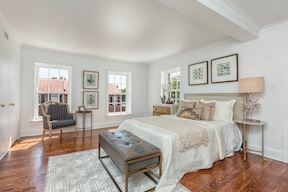 The bonus room, with a view of the garden, could be used as an office, play area, bedroom or storage. 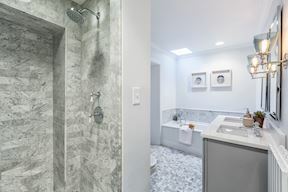 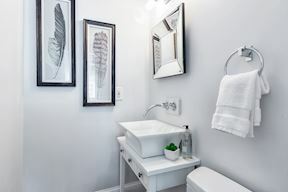 This level is topped off with an updated bathroom. 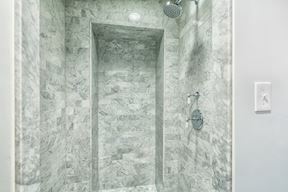 The lowest level which is at ground level has one of the most inviting rooms in the house. 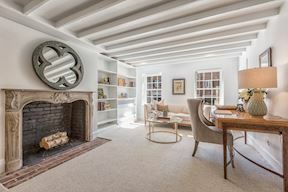 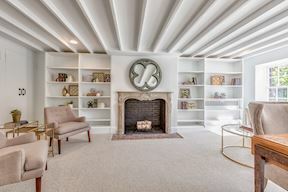 The library bespeaks the home’s 1801 heritage. 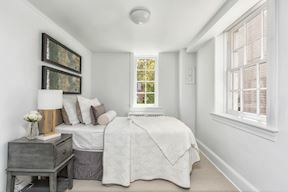 The new carpeting, windows just above street eye-level, and stone fireplace create a perfect setting for a relaxing moment, good read, or “welcome to this special home.” And, last but not least, is likely the best au pair suite in Georgetown with its separate entrance, cozy bedroom, adorable living area set for a optional small kitchen, and charming updated bathroom.